I once had a chance to appeal Art Therapy for the possibility of setting up the master's program of Art Therapy to a college. They set the arrangement and I talked with the dean of the college through TV phone. What he did was he also invited a teacher in Psychology and a doctor of Psychosomatic Medicine. There, the dean did not give his opinions, but the elderly doctor asked me, “when I was trained as a doctor, I was told that the most important thing was evidence. Do you have any evidence of efficacy of Art Therapy? Show me the evidence.” That was the first question. I talked about psychology but he said, “That is not evidence.” So, how do you talk about the evidence in the Art Therapy in such a case? I know at an AATA conference many years ago, they employed the word “evidence” as a main theme of the conference. It’s still a big question. Again, it’s interesting that you asked, because last night I was talking on the phone with a woman, who is now the chairman of the Research Committee for AATA. And one of the things that I suggested for this Washington, D.C. conference, is a research roundtable, and the conference as I told you is organizing about Creative Arts Therapies in Medicine, specifically, not Psychiatry. So I have invited people from Dance Therapy and Music Therapy and Art Therapy and Drama Therapy to participate in this Roundtable where they will talk about the issue you were just discussing, which is how much evidence do we have at this point. This will really make a difference in work. Have you heard about a man named Gene Cohen? Yeah, Gene Cohen. The man who was working with elderly people? I met him at the International Conference of Expressive Arts Therapy in North Carolina, 2007. Oh, right! His wife, Wendy Miller, was one of the founders of IEATA (International Expressive Arts Therapy Association). She is an Art Therapist. And Gene died, unfortunately, just as he was becoming elderly. He was 65, I think, when he died a few years ago. He was 64 when he had a bad cancer. But his research is so far the only research that actually shows evidence of effectiveness. 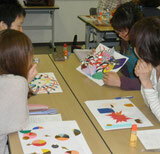 No I shouldn’t say that, there are other studies in Music Therapy especially, but he just provided art activities. They were not run by Art Therapists. They were classes, basically. And they demonstrated the effectiveness of art activities, that they made a big difference not just in how the people felt about themselves but also how healthy they were. So yes, we need much more evidence-based research. There are a couple of new books, one by Andrea Gilroy, who is British, called “Art Therapy, Research and Evidence-based Practice” and the other is by Lynn Kapitan who also went to Pratt (Institute), “Introduction to Art Therapy Research”. Music Therapy, in my opinion, is way ahead of Art Therapy in terms of research. Dance Therapy is starting to do research studies too. It’s tricky. It’s true that Shaun McNiff and many Art Therapists have done what is known as qualitative research or art-based research. But they won’t appeal to doctors like the one who was asking you the question, “What’s your evidence?” The person subjectively feels better about themselves when they have done artwork for a year, but such studies don’t show any objective evidence. Then it’s very hard to convince health care professionals, so it’s a big issue. I think it’s getting better, better than it used to be because Art Therapists are better trained. And we now have a lot of Ph.D. programs. In the United States, it’s just pretty new. We have doctoral programs. Those people are doing more in the way of research. Some people do this kind of quantitative research for Master’s degree but not a lot. I’d like to ask your personal opinion. Are you for these kinds of quantitative research? I think you have to show, you have to find a way to demonstrate to the people who are going to hire or pay Creative Arts Therapists that what they offer really makes a difference above and beyond “I feel better”. Now the quality of life is the thing that probably improves the most, and people are developing some scales. Honestly, I think that it’s necessary politically. I think it’s very foolish not to do it, because one of the big problems is getting funding. Having a university base, even in the United States, it is still difficult. In most of the training programs in the different universities it is hard to get funding for big research studies, and to have enough subjects so that they could do what are called double-blind studies. I will tell you something funny, …not funny but sad. But it’s relevant to our conversation. In my first job with the university, the research director of Child Psychiatry at that time was interested in Art Therapy and wanted to help me do research. And so he said, “What would you like to study?” And I gave him a long list of things. I really wanted to study, but I had no formal training in doing research. And he was willing to collaborate and to supply some funding. The one thing I wanted to study the most, he had no interest in at all. And it was the same old issue. What is the difference between the artist giving people an art experience and the Art Therapist working with people? I thought it would be very good to set up matched groups and to have somebody providing an art activity but without any discussion or processing except for the teaching and to have somebody else provide an art activity and then have some discussion of it or processing for later understanding. And he said, “I don’t see what good that study would do anybody.” (Laugh) Well, it would help the field. And the real funny part was that what was behind it in my mind was the fight between Edith Kramer and Margaret Naumburg. At that time, the first one was saying, “No, no. Art as Therapy,” and the latter was saying, “It should be Art Psychotherapy.” So, I wasn’t even thinking of a person who would call themselves an artist, but somebody calling themselves an Art Therapist whose main goal was producing good art. I thought it would be interesting to do a controlled study and then have the third group led by somebody doing an activity as another control group and then have the same… At any rate, I never could talk him into the study. That’s the kind of study that would be helpful. We still have to find good outcome measures and that’s one of the biggest problems. I think the tools available are a little bit better now than they used to be. We have people doing research using brain scanners to see what happens in the brain while the person draws. Not only when someone engages in art, but also what happens when the person looks at the painting. What happens to the brain? Does it stimulate endorphins? Why do they feel better? That’s some of the new ideas. It’s fascinating but that’s kind of a basic research. I think research is important. It’s important for art therapists to get allies in related fields so that we will have more chance of getting funding. Two days ago one woman came to see me. She works with the elderly. She is an Art Therapist. She is convinced that she can track the progress of Alzheimer’s. And she could also identify the signs of different stages not only in the disease but also of depression. She’s got a Neurologist who wants to work with her. That’s her luckiest part. The Neurologist is hooked up with a big teaching hospital. And so he is encouraging her to create a research design so he can present this to his hospital review committee to get money. It’s a very complicated process to get funding for research. But now is the time when I think the interest is high. I am an optimist, you know, I am always hopeful, but I think the possibilities are there. Whether Art Therapists would be able to find ways to use them effectively I don’t know. Diane Waller has just set up this research collaborative “Centre for Arts Therapy Research” in the UK. And I spoke to, in fact, a Music Therapist who trained in UK about that research. She said that she knows Diane and thinks that this Centre for research in the Arts Therapies is going to make a difference because the therapists were able to collaborate across different disciplines, but it took a Psychologist and a researcher in the university to work with Diane Waller to create this institute. It gets back to the need for allies from established professions. Yes, research is important. And it needs allies. And we cannot stay away from this issue. Uh-huh, because we will be knocked out. (Laugh) Music Therapists have done a very good job of showing things like patients undergoing surgery need less anesthesia when music is being played during the operation. Well, that’s powerful evidence. (Laugh) No, you can’t. I think it takes some imagination to think about the kinds of studies that could show the effectiveness of art therapy. Research requires quite a lot of creative thinking to figure out what kind of measures would really make sense. But I think it needs to be done. There is more than it used to be. If you go to the AATA website, you can download outcome studies. You know you have to be a member. And we can download a lot of outcome studies from the Music Therapy’s website too, right? I don’t know. I’m not sure if they would let you download except some general stuff. But yeah, you will see a lot of publications about Music Therapy. I mean, not publications but what they do, their methods...? They have well developed… You know Dance Therapy is getting there. And so is Drama Therapy. They are all working hard. But some Dance Therapists use art to assess the effect of Dance Therapy. For example, they use Draw A Person Picking An Apple from A Tree (PPAT) and Baum (Draw A Tree) Test. And Draw A Tree after Dancing. They do this kind of research. Yeah, that’s definitely done. And it’s interesting. I don’t know if it would convince the doctor, because the tree test isn’t that valid for most people except for the people who believe it’s a good test. That’s the problem. You have to… I think we have to find ways to test the effectiveness so that others can acknowledge it. I think even in Psychology it's not clear between subjectivity and objectivity. Even from the viewpoint of modern Physics the borderline between them is getting blurred. You're right. It's very hard to rule out the subjective factor. But objective measures are more valid. For example, something physiological like heart rate. Or, the number of times you go to the doctor or the number of pills it takes to reduce the pain. That’s objective. I love art-based assessment, but I don’t think anybody outside the field will be convinced by it.